Capturing the first kiss is something that for wedding photographers is a must have shot at weddings. Each time we take out our cameras at a ceremony we are tasked with this one moment that we all see coming, but have only one shot at getting right. There are many challenges with capturing this moment as we are not always sure where the minister will be and we can't re position ourselves once we choose our spot. 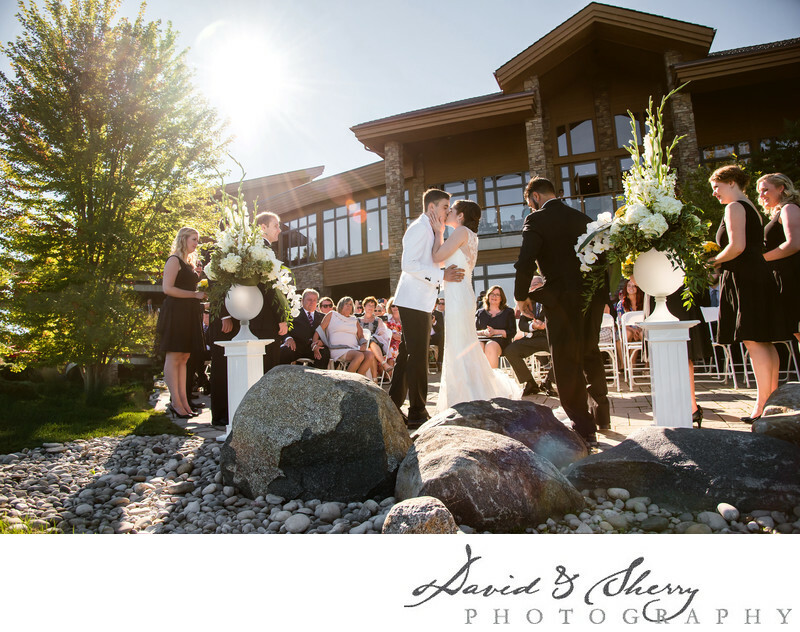 During this wedding on the ceremony location at the Lora Bay golf course in Thornbury, Ontario, Sherry of David & Sherry Photography beautifully captured the entire feel of the wedding of Nic & Laura with the clubhouse in the background with the sun high in the sky and the bride and groom's parents looking on filled with emotion. It is for moments like this that we continue to grow and learn in order to get the best for our clients. The Lora Bay ceremony site overlooks Georgian Bay and is a fantastic host for weddings. It boasts many photo locations over it's property and we are given permission to roam the property looking for the best lighting. It is our favourite wedding venue in Thornbury. Location: 175 High Bluff Lane, Thornbury, ON N0H 2P0.